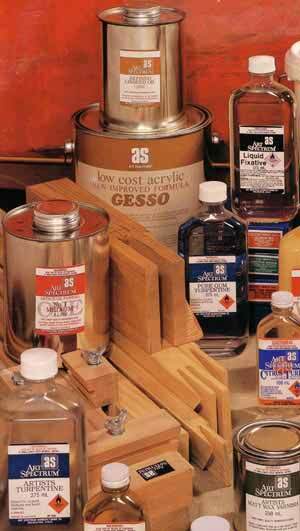 Art Spectrum Pure Gum Turpentine 4Litre Refined turpentine- Is a natural solvent for oil paint. Art Spectrum Pure Gum Turpentine 1 Litre - Refined turpentine - is a natural solvent for oil paint. Art Spectrum Oil Medium 4 1Litre - Also known as Liquol. Art Spectrum Oil Wax Medium 1 Litre A mixture of oil and wax- It imparts a lustrous satin finish. Orange Shellac Flakes 500g These flakes dissolve in methylated spirits. Art Spectrum Damar Varnish 1 Litre Use neat as a final gloss varnish over dry paintings- This varnish is fully removable. Art Spectrum Damar Varnish - 500ml Use neat as a final gloss varnish over dry paintings- This varnish is fully removable. Methylated Spirits 4 litre General cleaning for home and workshop As a primer in pressure stoves and lamps As an agent for auto fuel and French Polishing. Mineral Turpentine 4 litre Paint thinner and brush cleaner- Degreases metal and all paintable surfaces prior to painting. 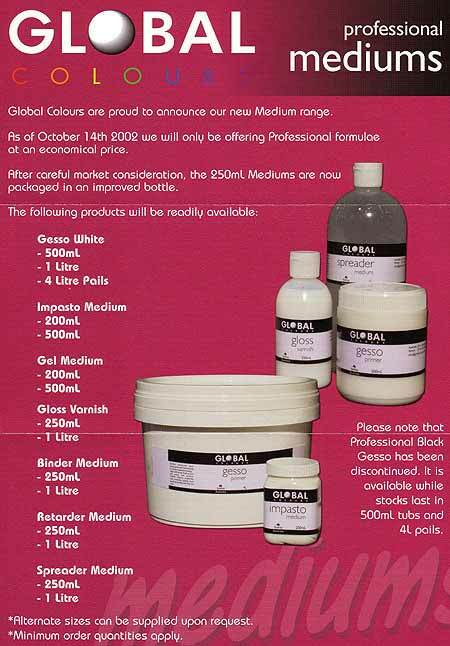 Global Binder Medium 1litre Is a concentrated pure acrylic emulsion which increases gloss and flow effects Ideal medium for glazing, sealing, bonding and collage work. Global Binder Medium 4lt Is a concentrated pure acrylic emulsion which increases gloss and flow effects Ideal medium for glazing, sealing, bonding, and collage work.